Instant square prints, just like old times. 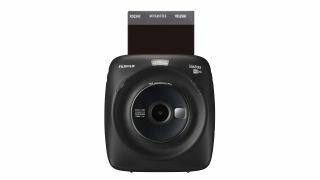 Fujifilm has revealed a brand-new instant camera to add to its Instax range - the Fujifilm Instax Square SQ20. Shown off at Photokina 2018, the latest Instax camera will spit out Instagram-like square photographs. And when we say Instagram, we mean it: the camera has 16 bespoke filters you can use before printing a 1:1 aspect ratio image. Given the photos are square and square is in its name, the body of the Fujifilm Instax Square SQ20 is, well, square and available in two options: black and, surprisingly, beige. Surprising as that's not exactly the trendiest of colours right now. The camera also comes packing video capabilities, with the option to shoot 15 seconds of video at a time, and it can also create a time-shift collage. It does this by taking four images at one time with a time difference by pushing a single button. You can have a time difference between 0.2 seconds up to 2.0 seconds. We reckon this camera will end up in our best camera for kids guide sooner rather than later. The Instax Square SQ20 will be available on October 20th, 2018 in the U.S. and Canada for USD $199.95 and CAD $249.99. Here's hoping it heads to the UK soon.